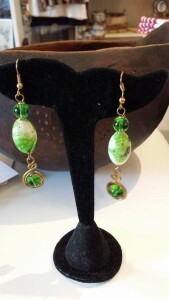 These beautiful handmade light-weight earrings are made from brass wire and multi colored semi-precious stones. The double brass wire is attached to the gold plated hooks. On both ends of the multi colored semi-precious stones you will find a black glass bead. 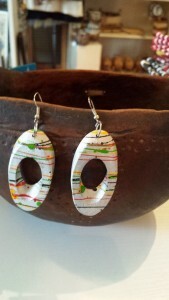 At the base of the earring you will see there is a flat hammered disk attached. 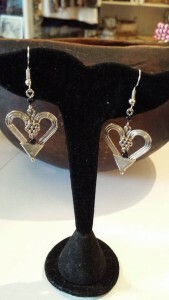 These earrings measures 3 1/2” in length which includes the drop and 1/4” wide. They are a true one of a kind. 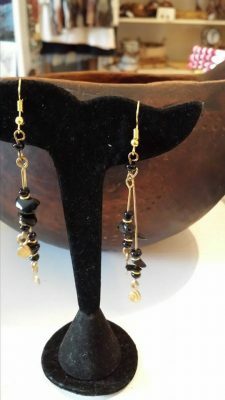 These beautiful handmade light-weight earrings are made from brass wire and black semi-precious stones. The double brass wire is attached to the gold plated hooks. 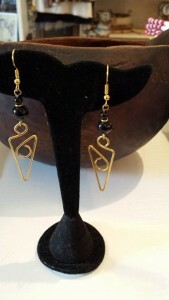 On both ends of the semi-precious stones you will find a black glass bead. At the base of the earring you will see there is a flat hammered disk attached. 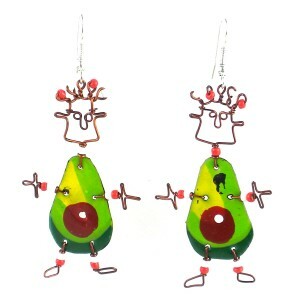 These earrings measures 3 1/2” in length which includes the drop and 1/4” wide. They are a true one of a kind.